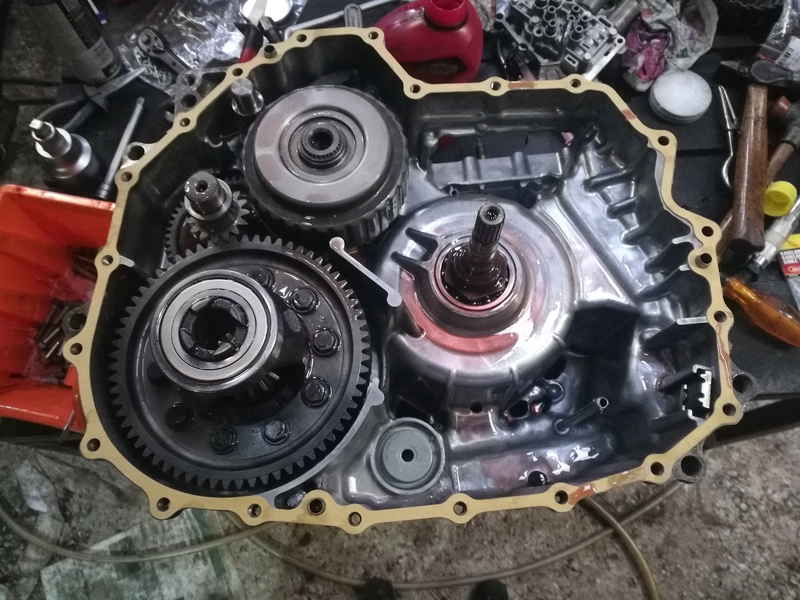 In this topic I would like to share my experience with the removal, small overhaul and installation of the CVT transmission from a 2003 Honda Jazz. I started with this nice project because I got problems with my car one month after purchase (see topic https://clubjazz.org/forum/index.php?topic=10616.0). I had some experience with simple mechanical work on cars, mainly classic cars but I never did a job of this size and level. I do however own a car lift and although it's possible to do without I would not recommend it, because it would be a hassle. Don't hesitate to ask me any questions as I know quite a lot about the subject now, I got a little obsessed by it Also comments are appreciated because I might have gotten some things wrong. - One of the first actions on the list is loosening the axle nuts. Go out and get a large breaker bar with 500mm length or something (if you dont have powerful air tools) because they can be really stuck. Also be sure to thoroughly punch away the nut indentation so the nut can turn freely. You can get replacement nuts on Ebay for a few euros a piece so you might as well get them when you reassemble. (https://www.youtube.com/watch?v=hJR77aN-MDk). The upper one I removed by using a gear puller. 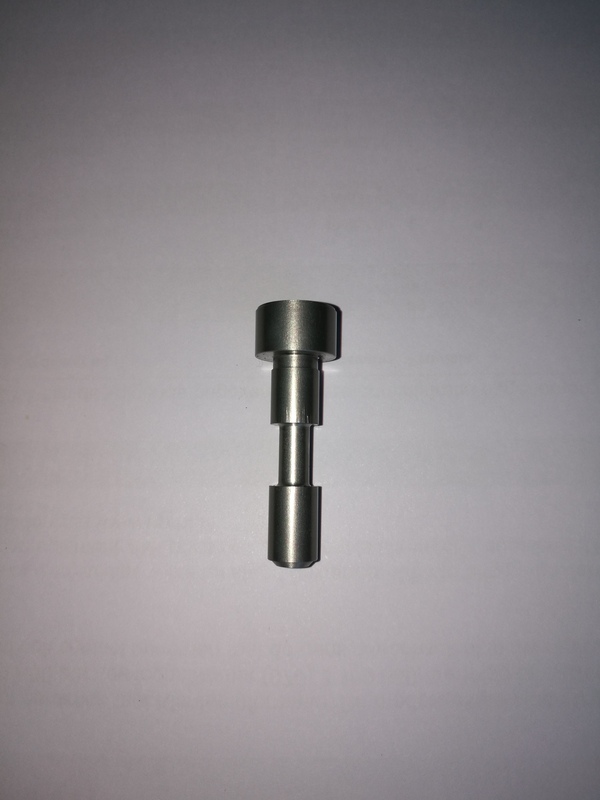 After this job I went to aliexpress.com and purchased this one: https://nl.aliexpress.com/item/2-Pieces-Professional-Ball-Joint-Removal-Tool-Puller-Separator-Tie-Rod-End-Tool-22-mm/32889027408.html?spm=a2g0z.10010108.1000016.1.60a7406exl2LBR&isOrigTitle=true . It looks pretty decent. - The sub-frame has to come off at some point. You can get a bit confused where the bolts of steering house and transmission support are so this picture could be useful. The main sub-frame bolts were a bit rusted and they advise to replace them. I could not find them online so you might have to go to the Honda dealer if you want to be safe. I decided to put the same bolts back although they were a bit rusted. - They say you are going to mess up your alignment by removing subframe etc. so take into account that you will maybe have to re-align it after re-installation. 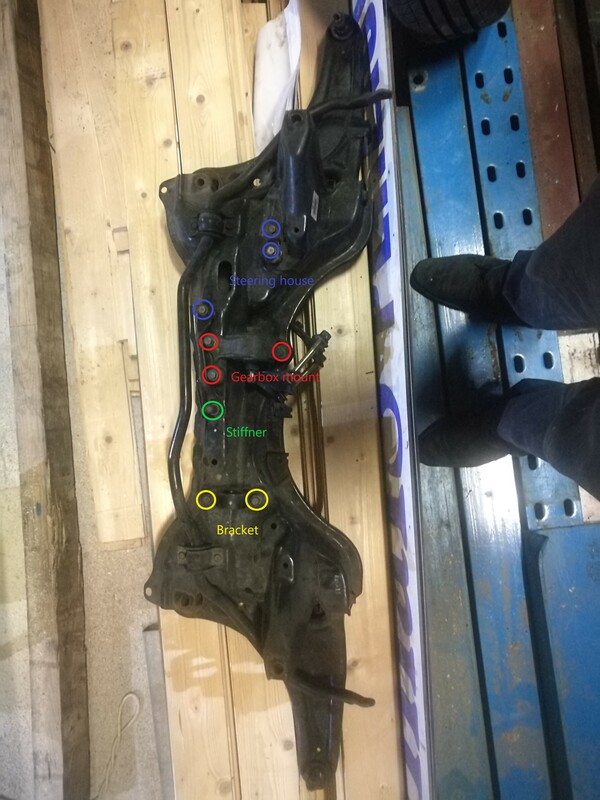 - I took the box out by supporting the engine on a jack that was resting on the carlift and the transmission was supported by a large support on the ground. Then I simply lifted the carlift to take out the transmission. 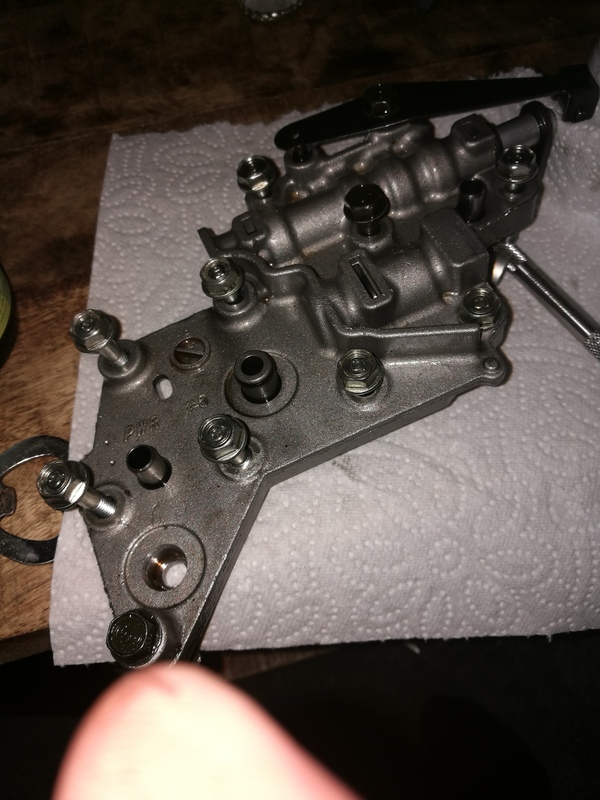 - Be careful when you have extracted the transmission because there are plastic connectors on the sensors and solenoids which can break easily (one of mine did). Also be sure to locate the dowel guides because its easy to lose one. If you would like to overhaul the transmission I can recommend you to watch the Brazilian videos that are available on youtube (see links below). Although you might not understand what the guy is saying, you can see what he is doing. See links below. 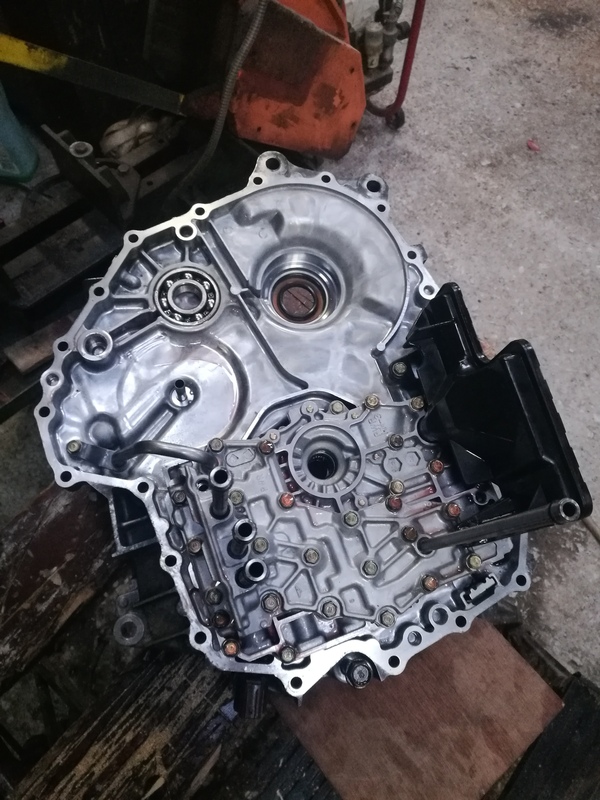 Because at first I could not find a decent and reasonably priced replacement for my transmission on the scrapyards, my first plan was to find the defect and fix it. So I went ahead and disassembled the cvt just like on youtube. I was hoping to find some broken O ring or completely worn out clutch plates somewhere but all I found was quite a lot of dirt. 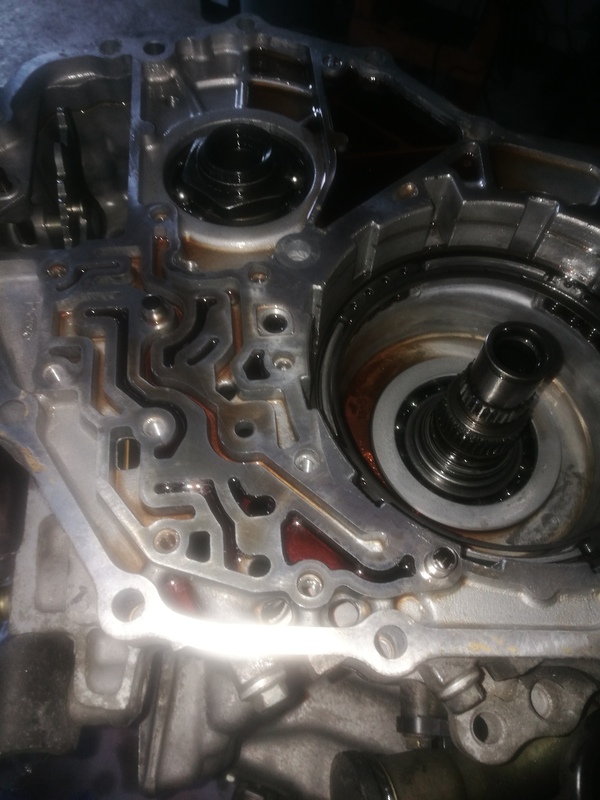 So my theory is that this CVT developed problems because the oil was not changed frequently. 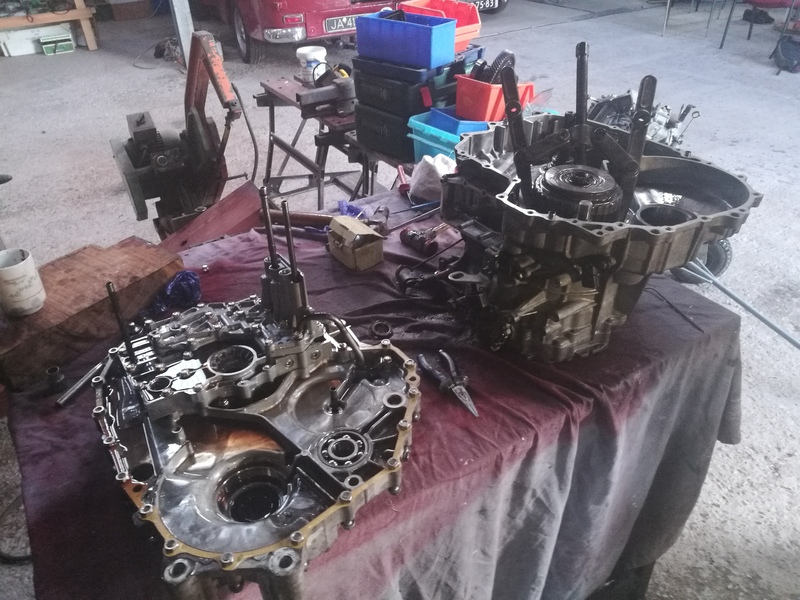 I did not have full confidence that only a clean up would fix my problems and then an offer for a replacement CVT for 200 euros came along so I decided to buy that one. 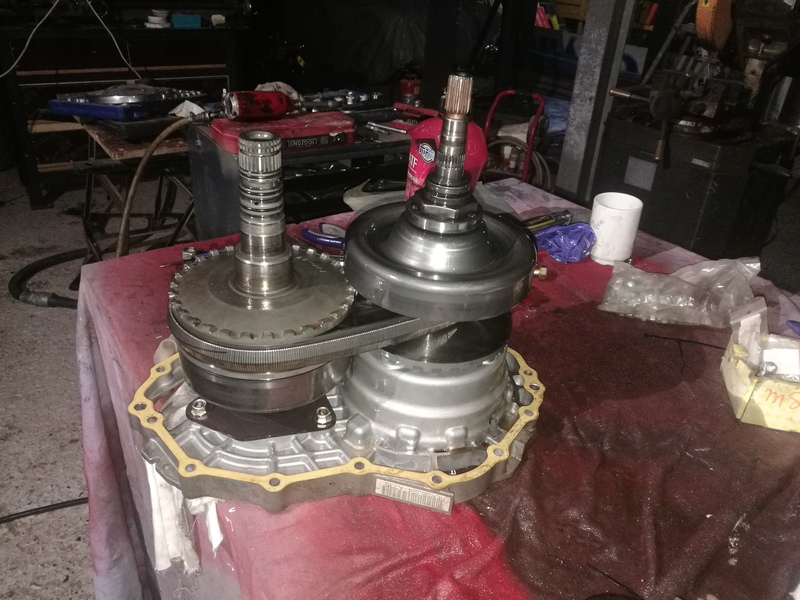 But then I was thinking it does not make sense to just build this gearbox into the car without doing any inspection and at least replacing the filters. So I decided to open up this one as well and do the following service on the interior. You can do this already with the transmission still in the car. You can access it below the air filter. - 1 for a circuit that controls pressures when there is no electrics. 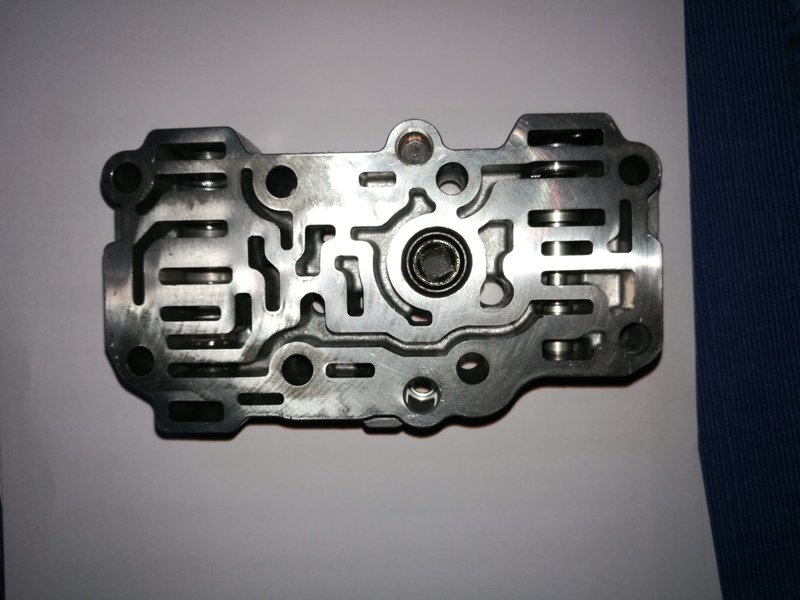 The control valve body does not control forward and reverse clutch as there is a manual valve body in the transmission that does this by simply using the motion of your shift stick to direct flow to the applicable clutch. In the control valve body there is a filter that you can clean and you can test the solenoids. You can measure Ohm resistance to check if it is in tolerance (http://www.hondafitjazz.com/manual/A00/HTML/02/SAA2E02E15117722252FEAT10.HTML). You can also put 12 volts on the connectors to hear them click and see them move . You can even attach a 12v PWM transformer on the leads to control the solonoids yourself. Also check the O-rings on the feed pipes for wear, you dont want to lose pressure here. 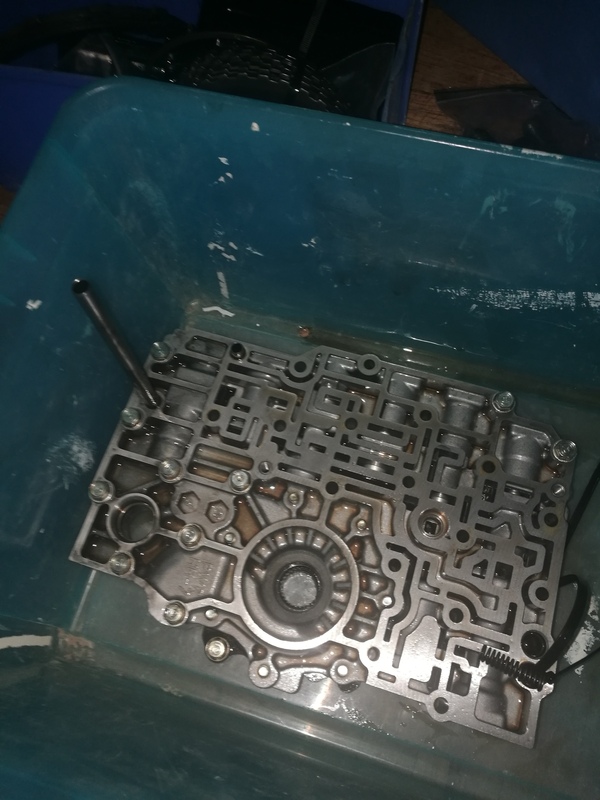 The two non-electronic valves (the second stages) can be taken out and cleaned, or at least check if they move (with a flathead screwdriver). If you want to do it properly, you can polish the bores until the valves fall into and out of the bores on their own weight. Easiest way would be to use special bore brush (like Superior Bench Buddies), but you can also do the polishing by rolling up some fine sandpaper (like 800 grit, plus maybe a bit of atf oil) and twisting it inside, this worked for me. Also use a lot of compressed air to clean up. Open up the flywheel case by removing all the bolts on the side where it was attached to the engine. Note that there are two bolts with longer thread. Opened up, here shown with the puller tool on the starter clutch. Clean up all the dirt inside (I used a lot of brake cleaner), replace the two filters and maybe any worn out O-ring or seal. When reassembling you would need a new flywheel case gasket. Be careful with the bolts because I managed to break three of them, use a torque wrench. If in doubt about your starter clutch, you can replace or service it here as well. The starter clutch is the one that fails the most because its constantly pulsing on and off. You want to make sure its in good shape. Its easy to remove with a gear puller. 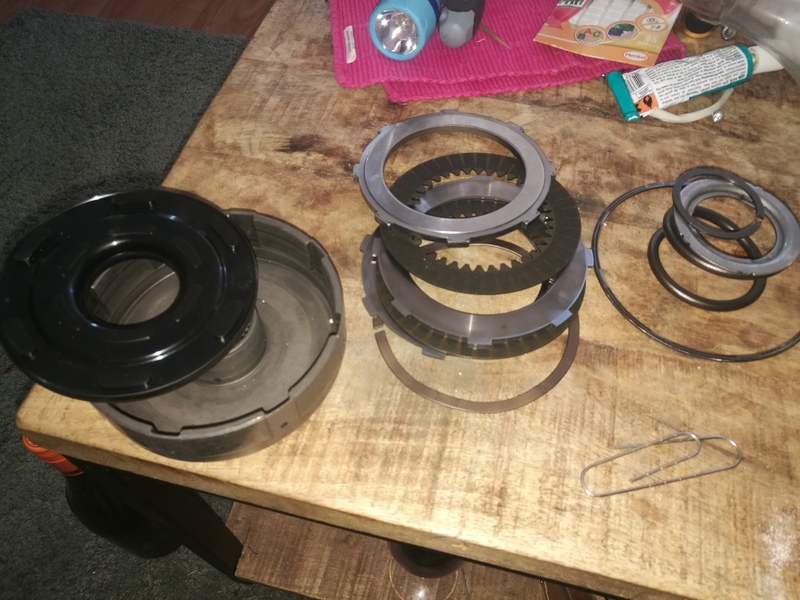 I found that my two transmissions had different versions of starting clutches and they are exchangeable (see link below). Honda decided to do a new design in I think 2005 because of all the problems with this clutch. They increased the surface area of the friction discs, which makes a big difference because there are in total eight surfaces. They also changed the spring mechanism. The new design clutch. Friction plates taken out, here you see a spring retainer and the piston in silver around it. Another part that can fail is the piston inside the starter clutch, which is made out of steel with vulcanized rubber. 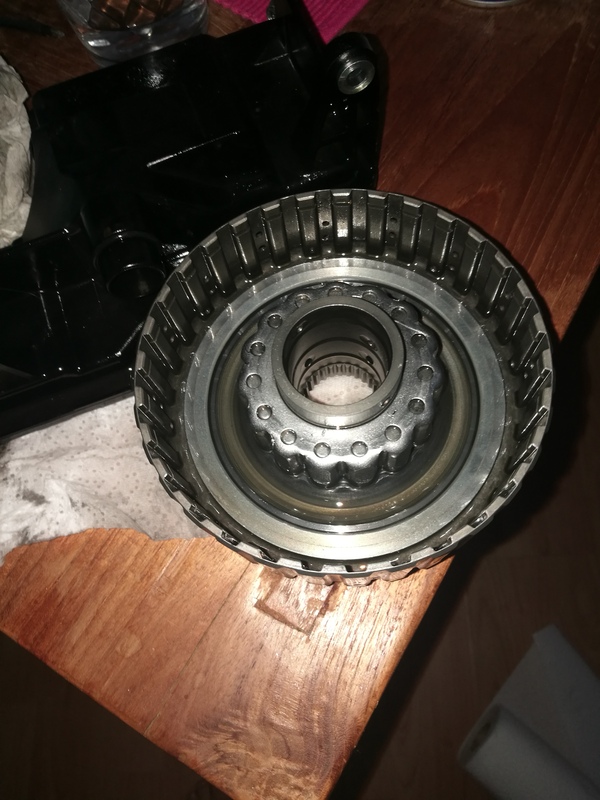 For me it was initially difficult to get the piston out of the drum, but this turns out to be very easy if you can pressurize the shaft on which the starter clutch is attached (use an blow gun with a rubber tip or improvise something like that), after you have removed the steel snap ring. In this way you can also test the piston if you still have the snap ring in place. Reinstalling the piston is fairly easy, but the spring retainer is pressed on the hub and needs some force to do so. 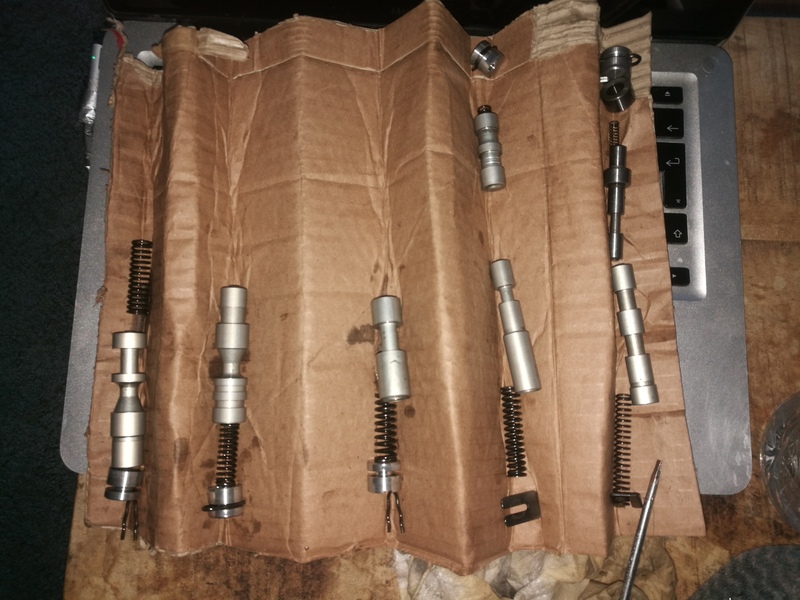 I purchased a cheap automatic clutch spring compressor tool to do this (ebay). Reinstaling the clutch assembly can be done with a hammer. You dont need any special tool, but needs a bit of persuasion. If there is a lot of dirt, you should also clean the main valve body which is in the same area. 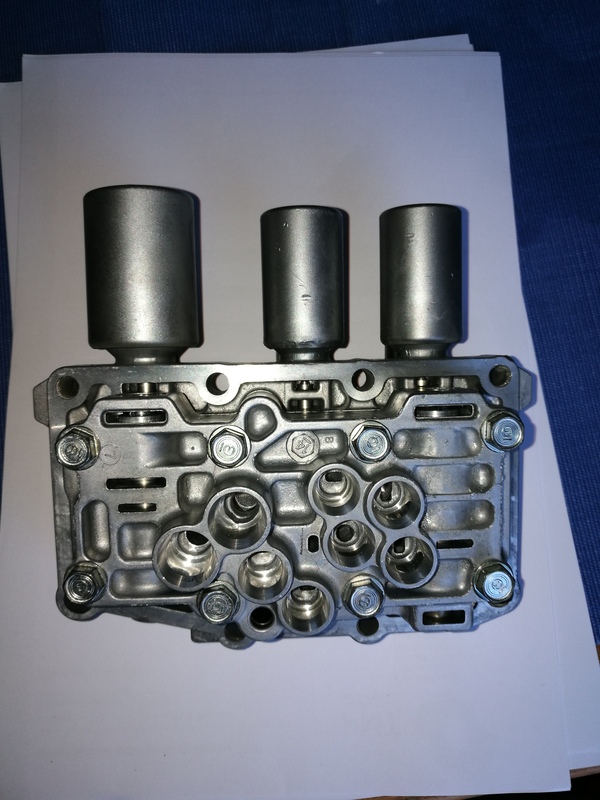 Again you can clean the valves/bores like described above. There is also the oil pump which you can clean. The bolts holding the pump should be tightened with the right torque so it is still free to rotate. You can go further and open up other sections of the box to clean up/service forward/backward clutch, manual valve and even the CVT pulleys. But unless you have problems with them I wouldn't recommend to go that far. Forward and reverse clutch removed on the right. Manual valve removed on the left. - lubricate moving parts with CVT oil. - Be sure to make a lot of photos and more important: keep everything very organized, it's so easy to loose something. - I struggled a bit with getting the drive axles in place. I tried by pushing them in. But later I heard you can also use a hammer from the wheel side to pop them in, probably that works. - Torque all the bolts again when the weight is on the wheels. The first time I drove I heard some scary sounds and tightening everything again fixed it. - The start clutch calibration is overrated. Didn't have any effect for me. - If you get a malfunction light when you put ignition on you probably forgot one of the solonoid or sensor connectors. - 4 liters is not enough oil to fill it up after overhaul. I think I needed about 5. Excellent post, well worth the effort.